Siri, please port yourself to the iPod touch. “Sorry, I’m afraid you will have wait for hackers to port me to other iOS devices.” That when two young hackers @euwars and @rudollf77 came in and ported Siri to the iPod touch. The two hackers have posted the video embedded below demonstrating Siri running on an iPod touch 4G. 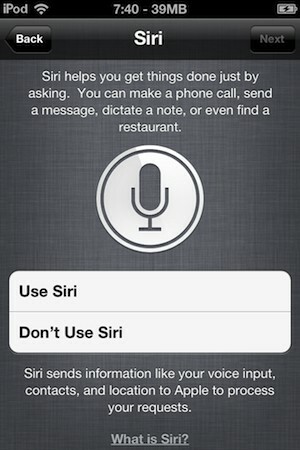 As the same issue with the iPhone 4 and iPad port, Apple blocks requests to its servers from non iPhone 4S devices so Siri will not be able to respond to you if you’re using a ported version of Siri on an iOS device that is not the iPhone 4S.